Given that I had to bump the list up to 2K for March 20th, as well needing to swap out the Soul Grinders for… something else, I’ve done some thinking about my lists. My 1,750 list has been unchanged. Part of me looks at all the scary new psychic powers that these new codices have… but then the other part of me tells me that Blessing of the Blood God really wouldn’t be as useful as it should be (since it only works for wounds). My 1,850 list is identical to my 1,750 list. 100 points just isn’t enough to buy another unit, so I have to throw more points at the units I have. My 2,000 point list is considerably rougher. For one, I’m swapping out the Soul Grinders with which I’m very comfortable and happy for Daemon Princes I’ve never put on the table. Furthermore, besides the Daemon Princes, I really don’t want to add any new models: I’ve got my eye on shifting from running mono-God to something more… ecumenical, while sticking with the Khornate theme. That will involve some fun conversions and such… none of which I’m permitting myself to think about until I’m done with this mess. The Daemon Princes I’m not particularly happy with. They’re loaded up with a bunch of crap that gets them up to 170 points a pop. That’s the same cost for a Winged Daemon Prince with Iron Hide, which I think would probably be considerably more useful… but I don’t think I can run them ’cause I can’t think of a way to model them this side of ordering Tyranid Warrior Wings, which is cost-prohibitive. Also, I’m kinda-sorta holding out for the plastic Daemon Prince kit. I’d run them cheaper… but I don’t have anything else on which to spend the points. There’s a lot of room for improvement with the 2K list, but it’ll get me to where I need to be for the time being and it should, hopefully, be a fun list to play. Then, come April, it’ll be time to look to diversification. 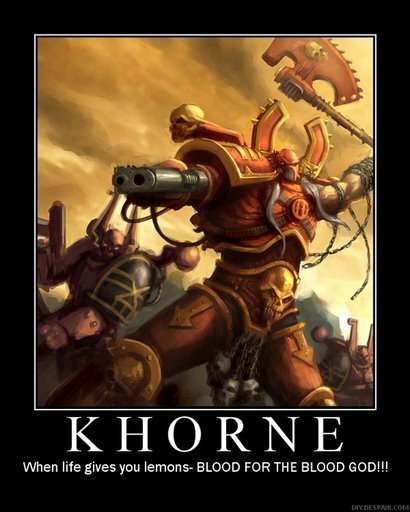 This entry was posted in Warpstone Pile and tagged gaming, khornate daemons on 2010-02-10 by Rushputin.